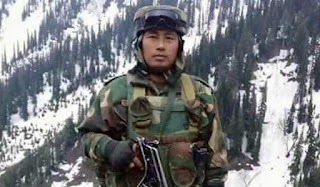 Havildar Hangpan Dada, who died in Kupwara on May 27 after killing three terrorists, has been awarded Ashok Chakra, while Lt. Col. Niranjan Ek of the National Security Guard, who died during Pathankot operations, was awarded Shaurya Chakra on the eve of Independence Day by President Pranab Mukherjee. In all, 82 Gallantry Awards have been awarded this year to armed forces personnel and members of paramilitary forces. They include one Ashok Chakra, 14 Shaurya Chakras, 63 Sena Medals (Gallantry), two Nao Sena Medals (Gallantry) and two Vayu Sena Medals (Gallantry). Of the 14 Shaurya Chakra medals, 11 went to the Army, one to the Air Force and two to police personnel under the Home Ministry. Army Havildar Hangpan Dada – a resident of Arunachal Pradesh -- was posthumously honoured with the Ashok Chakra while National Security Guard lieutenant colonel Niranjan EK was posthumously awarded the Shaura Chakra, the country’s third-highest peace-time army award. Niranjan EK was head of the NSG’s bomb disposal unit that was rushed to the Pathankot airbase after a militant strike on January 2 but died when a hand grenade strapped to a terrorist’s body explored.